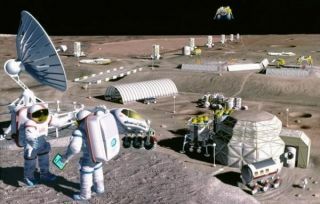 Humans might not be living on Mars or the moon anytime soon, but scientists might have just overcome one major hurdle on the route to interplanetary habitation: electricity. Scientists at the U.S. Department of Energy's Idaho National Laboratory have designed a suitcase-sized nuclear plant that can power up to eight normal-sized homes. Thanks to its size and durability, the plant can provide fission power not only on Earth, but on the moon, on Mars, or any other place NASA requires a power generator. "Just taking it down to that size has a lot of significant differences," Werner told InnovationNewsDaily. The team plans to build a physical demonstration unit for the plant and test out its capabilities next year. Astronauts currently use solar cells — which convert light into energy — to power their crafts and devices. However, light sources might not be consistent or reliable in outer space. This nuclear power plant could generate a larger, and far more dependable, supply of electricity. Nuclear power has been a bit of a controversial issue here on Earth thanks to several overheating accidents that have led to catastrophic disasters, such as the infamous Chernobyl meltdown. However, those incidents wouldn't pose a threat to astronauts using this portable reactor, Werner said. "There would be no danger of meltdown," Werner said. "Because of the low power level, it's very safe. If we did have a situation where the power failed, the reactor itself would just shut down." Though NASA has ended its space shuttle program, Werner isn't worried about the shutdown affecting this program, pointing out that the power plant would use an entirely different launch vehicle. He's optimistic that once the plant is complete, NASA would allow the team to send it out into space and see what happens. "I hope that someday we get a chance to actually put into hardware on a flight," Werner said. "That'd be a big day for everybody."